Just about 10 years ago, the world was feeling the effects of the Great Recession, the most significant economic decline since the Great Depression. Famous chain stores were shuttering doors all over the country, and in just a couple of years, the ominous phrase “Retail Apocalypse” entered the national lexicon. It was hardly an auspicious time to start a new business. But that didn’t deter the Sohns family of Bucksport, who opened a specialty shop in a tiny, homemade shed located on the side of busy Route 1A on the way to Ellsworth. They knew they only had a moment or two to catch a curious driver’s eye, and that is why they named their business “The Rock and Art Shop,” one of the family members explained recently. “We needed to say what we sold in very few words,” Annette Dodd, one of the co-owners of the store, said. It worked. Despite the trouble happening to retail on a regional and national level, drivers did stop at The Rock and Art Shop and the little store caught on. Soon, the Sohns family began to expand. They opened a store on Central Street in downtown Bangor, where office workers and others stroll by their eye-catching window displays and venture inside to shop for one-of-a-kind gifts and goods ranging from the weird, like praying mantis egg cases, to the sublime, such as necklaces made of crystalline, purple Brazilian amethysts. The original shed on Route 1A is closed now, but the family also has opened shops in downtown Ellsworth and downtown Bar Harbor. They also have a website where they sell some of their goods, but the bulk of their business happens the old-fashioned way, through shoppers wandering into their three downtown shops. What is happening with The Rock and Art Shop is, fortunately, not an aberration. The renaissance of Maine downtowns such as Bangor, Belfast and Rockland has a lot to do with the robust slate of small, independent businesses operating there that — so far at least — have largely been able to weather the challenges posed by price-slashing big-box stores and online retail giants like Amazon.com. And that, in turn, is good for Maine, according to many economists. Studies by sources including the Federal Reserve Bank of Atlanta and the private research firm Civic Economics show a link between independent, locally owned businesses, healthy communities and economic advancement. In fact, small business ownership has been a pathway to the middle class for generations of Americans, according to the Institute for Local Self-Reliance, a national research and technical assistance organization that helps communities take charge of their local resources, economies and environmental future. Independent businesses generate a lot more tax revenue for communities than the average big box stores. A 2013 analysis from the Government Finance Review showing that a community receives about $7 in property taxes per acre on the average big-box retail store compared to $287 per acre on a mixed-use, mid-rise business district. As well, shopping at local independent businesses triggers something called the “multiplier effect,” which means that those businesses recirculate a much greater percentage of revenue locally compared to online or absentee-owned businesses, such as big-box retailers. A 2003 study conducted by the Institute for Local Self-Reliance in several Maine communities looked at how much of a dollar spent at a local independent store is re-spent in the local area through payroll, the purchase of local goods and services, donations to area charities and profits spent locally by owners. It found that each $100 spent at local independent stores generated $45 of secondary local spending or more than three times the amount generated by spending at big-box chain stores. “In other words, going local creates more local wealth and jobs,” the American Independent Business Alliance said on its website. And Maine communities are doing things to help. 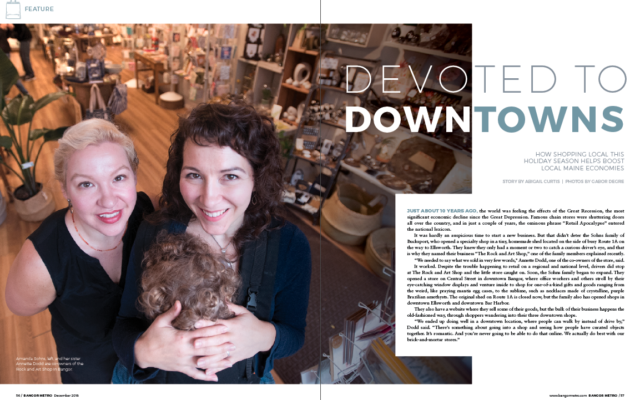 Organizations such as the Downtown Bangor Partnership and the Main Street Maine groups around the state strive to advance and strengthen downtowns. In Bangor, an initiative called “$10 on the 10th in Downtown Bangor” encourages shoppers to spend just $10 at a downtown store on the 10th of every month, and Plaid Friday is the downtown business community’s response to Black Friday on the day after Thanksgiving. No one needs to explain that to Sierra Dietz of Belfast, whose parents founded the Grasshopper Shops in 1975 when they opened the first store in a former newsstand and bus depot on High Street in Belfast. That single shop evolved over time into a popular chain, with locations in Rockland, Searsport, Bangor, Ellsworth and Bangor International Airport, where shoppers could come in for gifts, housewares, clothing, toys and more. Time and family changes took a toll on the chain. The Bangor and Ellsworth stores closed in the past decade. But with three stores still going strong, Dietz said the shops continue to support the local economy. In the Rockland store, which she owns, she has between 15 to 20 full and part-time employees, but payroll is not where the Grasshopper Shop’s economic contributions stop. But, she feels, the value generated by a healthy downtown cannot be counted only in dollars. Dietz, who grew up helping in her family’s stores, truly loves being part of the local retail landscape. As she and her employees get ready for Christmas, one of the busiest and most important times of year at the store, she feels excited and enthused. And the good feeling isn’t confined to her own store. Dietz and the other Rockland merchants work together, putting on special events and sending shoppers to other stores to find exactly what they are looking for. There’s camaraderie and a strong feeling that the old adage is true: A rising tide does lift all boats. She and other merchants hope the good feelings and the great experience that can happen when people choose to shop downtown will continue to bring shoppers to their stores. The future of local retail is not necessarily 100 percent rosy, of course. Betsy Lundy of Bangor knows that from personal experience. Her store, the Maine Cloth Diaper Co., closed in January 2018 after seven years in downtown Bangor. Lundy, who now works for the city of Bangor as the new Downtown Bangor Coordinator and Cultural Commission Liaison, hopes her story may be instructive to others. That vision was simple and personal. Lundy “hates going to big-box stores,” she said, with their tendency to put items that are not necessities in a person’s path. She also wanted her store to be a social, educational place, and it was, she said. However, that didn’t mean it was profitable. Some browsers would wander around, taking photos of items she had for sale that they would then search out on cheaper, online retailers. That hurt, she said. Still, she thinks that others can learn from what she did and didn’t do. Small retailers have a much easier time creating an experience for the shopper than big-box stores do, she said. They also can more quickly react to what their customers want. And customers can get something they may not even know they are looking for when they shop at downtown stores.